This 3 day course is equivalent to Nerve Reflexology Level III as provided by MNT-NR International. Nerve Reflexology with Touchpoint at your own pace. Take 1, 2 or 3 modules in any order you like. 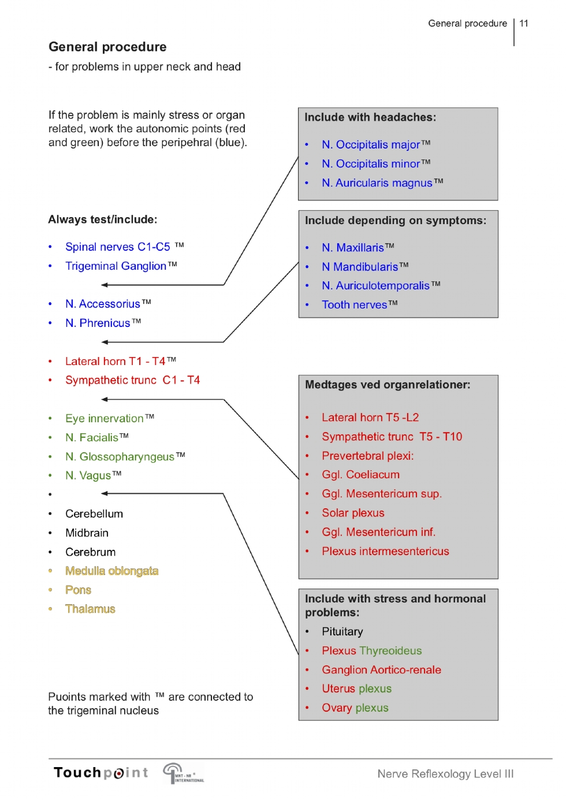 Tooth pain and TMJ tension and the trigiminal nerve. A shortcut to faster and more efficient treatment, Nerve Reflexology is a therapeutic method that works directly with the nervous system. 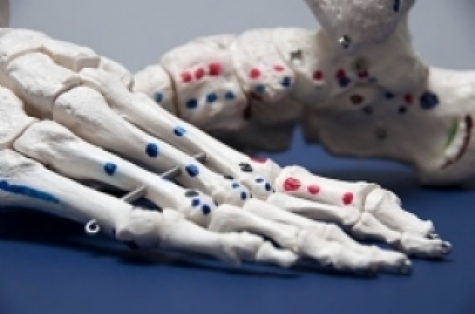 The method uses more than 100 precisely localized points, all of which are found on the periosteum of the foot skeleton. Each point reflects a specific nerve or structure of the nervous system. Points are treated with a static manual pressure until any pain in the point has subsided, but maximum 15 seconds. The method has therapeutic value and at the same time provides diagnostic feedback about the condition of the body’s tissues. Because impulses are given directly to the nervous system, the method allows for very precise treatment, and the effect often occurs immediately. For example, it is easy to observe how tight muscles relax immediately by testing range of motion, and clients often feel surprisingly quick pain relief. The Overview of techniques shows all the techniques we teach in the workshop. Towards the end of the course, we discuss the overview of techniques, which, built on our clinical experiences, is meant as an inspirational tool and a way to remember the new techniques. Touchpoint offer diploma courses in Nerve Reflexology. The complete training consists of 3 individual three-day modules. All 3 modules include introduction and basic technique, and you may therefore follow the courses in any order you wish. If you would like to become a licensed Nerve Reflexologist, you need to pass the exam we offer after completion of all 3 modules. Nerve Reflexology was originally developed in Germany by Walther and Ellen Froneberg. Today the method is constantly being extended and refined under the auspices of Belgium based MNT-NR International headed by physiotherapist Nico Pauly. Nerve Reflexology is best known amongst physiotherapists and reflexologists in Germany, Belgium, The Netherlands, Denmark, Greece and United Kingdom. On Touchpoint courses and workshops you benefit from having two instructors throughout the days. Dorthe Krogsgaard and Peter Lund Frandsen are both highly experienced international teachers, who present a mixture of theory, demonstrations and lots of hands-on practice. This workshop is taught in English. An extensive fully illustrated workbook is included with the workshop. The course is open to all types of manual therapists. Basic knowledge of anatomy and physiology is a great advantage. 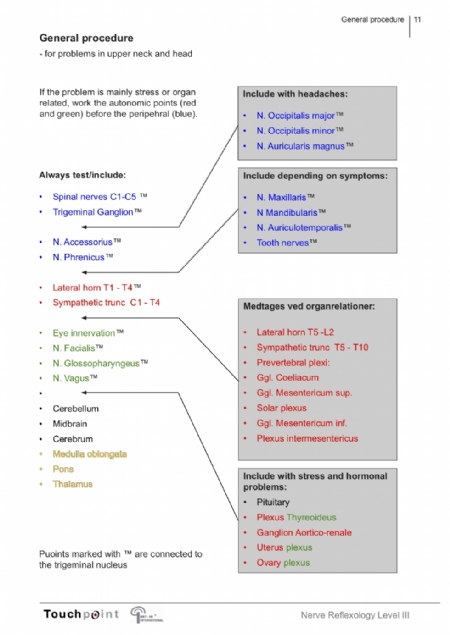 The necessary theory about the nervous systems and the function of individual nerves is covered during the course. This workshop is part of our Summer School, which takes place in Copenhagen this summer. Peter and Dorthe are internationally respected leaders in reflexology; both as practitioners and teachers. I encourage reflexologists everywhere to expand their theoretical horizons and integrate the hands-on techniques from this workshop in their daily practice. You and your clients will be happy with the results! Touchpoint is well-known around the world for a high professional standard in reflexology. I recommend their teachings, which can widen your practice with great benefit. Peter and Dorthe presented the most organized and professional training class I have ever attended in my adult life. As a 46-year-old veteran I have been through many classes from military training, to underwater welding, to different types of healing modalities. I was very impressed with the work Peter and Dorthe are doing. Thank you for the wealth of information I will be putting to valuable use. Cheers. Dorthe and Peter took a complicated subject like anatomy and made it very easy to understand as well as remember. They're phenonemal instructors that take necessary time with you as an individual to show you exactly where and how to work on your clients. This is easily one of the best reflexology classes I have taken.